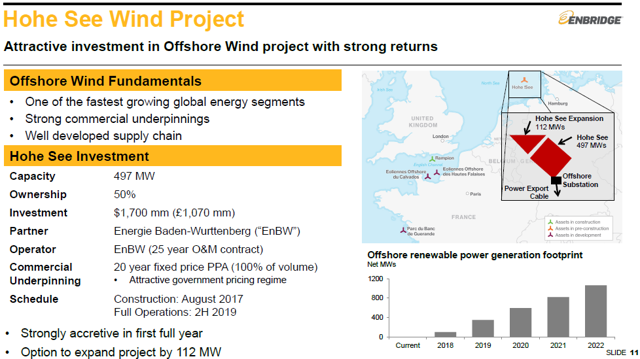 Enbridge entered the offshore wind energy market in 2015 and obviously liked what it found. A new partnership with energy Giant EnBW extends the company’s wind energy footprint to offshore Germany. Enbridge’s renewable portfolio already generates over 1.9-GW of clean energy. As a result, Enbridge is an emerging wind energy giant. Long-term wind energy PPAs will increase ENB’s base of secure and stable EBITDA streams. 100% of the power generated effectively receive long-term fixed pricing by 20-year power-purchase-agreements, or PPAs. The project has achieved all key regulatory approvals. Fixed-price engineering, procurement, construction and installation contracts have been secured with key suppliers representing ~90% of all the project’s capital costs. On the Q4 conference call, management said it would not be excited about the project if the returns were “in the high single digits.” That statement implies low- to mid-teens returns. In other words, HoHe See is a low-risk project that will deliver very attractive returns for two decades. Construction is scheduled to start in August and the project is expected to reach full service by the second half of 2019. Enbridge expects to spend $600 million on the project this year, while the total investment is expected to be $1.7 billion. The project has been pre-funded, in part, by a $750 million preferred share offering last November. Enbridge has an option to participate in a future 112-MW planned expansion project. That would increase the Hohe See Wind Project’s total capacity by 22.5% and is an attractive organic growth opportunity for ENB going forward. Previous article Why Not More Vertical-Axis Wind Turbines?